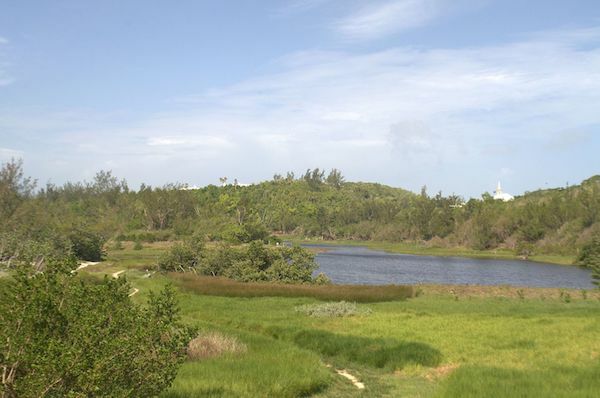 Spittal Pond is the largest wildlife sanctuary in Bermuda, and a lovely spot for running. The pond is located in Smith’s Parish right off South Rd./Knapton Hill Rd. A 1.2 mile perimeter trail goes around the 8-acre pond, with wonderful ocean views at the height of the trail. In the wooded section, you’ll see Bermuda Cedar, prickly pear cactus, olivewoods, casuarinas, palmettos and pittosporum. There are also many spice trees and Mexican pepper trees along the trail. For a longer run, we’d recommend continuing on South Rd. for up to 1.2 miles toward John Smith’s Bay and Pink Beach. This section of South Rd. has great water views and doesn’t have that much traffic, as most cars use busier Knapton Hill Rd. Two entrances off South Rd.